BMW’s profile in the racing enduro market seems to be slipping of late. (Which is a pity, because the G450X offers promise, as well as BMW’s usual 24-month warranty.) But this factory-endorsed, 900 cc boxer enduro from almost thirty years ago shows what could have been. 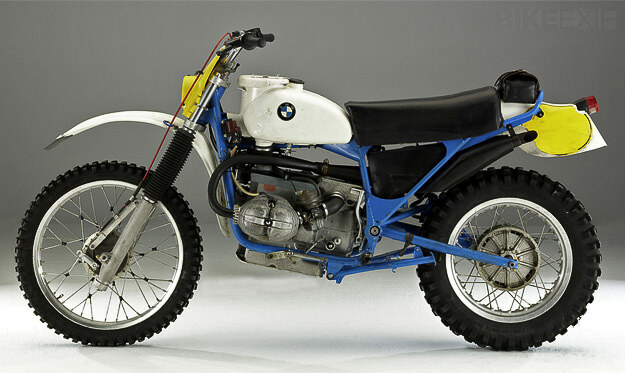 In 1980 it won the German and European enduro championships, plus the prestigious ISDT. The bike apparently sports 50 bhp and weighs just 132 kg, and inspired the cultish BMW R80 G/S (Gelände/Straße, or off-road/street) built from ’81 to ‘87. That machine married the 800 cc R80/7 engine to a strengthened R65 chassis, and was the only BMW twin to be unaffected by the launch of the K series. For more obscure BMW off-roading goodness, check out this gallery from German BMW race preparation expert HPN.